Welcome to Cheshire Fire Department’s official web site! The Cheshire Fire Department is a volunteer department which provides fire and emergency medical services to the residents and visitors of the Town of Cheshire, Massachusetts. The department responds to approximately 370 calls for service each year. Our department strives to achieve professional level training standards despite the volunteer status of our members. We are proud to say that nine of our current members, including ALL of our leadership, are board certified Firefighter I/II trained. 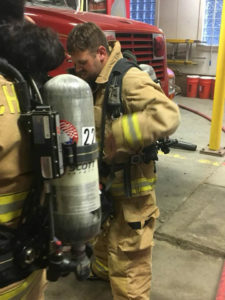 All of the remaining members of the department are trained to the Firefighter I level. In addition to responding to the calls for service within our town, the department is part of a Berkshire County Mutual Aid System which allows us to assist other municipalities within our region and even beyond in some circumstances. The Cheshire Fire Department also has one of only two certified Rapid Intervention Teams in Berkshire County. This team, also referred to as R.I.T., provides a special skill set to rescue downed firefighters.